This summer, our Outreach Team are running a series of summer schools for young people aged 16 plus, studying at our partner schools and colleges. The summer schools are the second step in a series of opportunities that seek to inspire and support students who are first generation in their family to apply and progress to UAL. Students have the chance to focus on a particular discipline, respond to a project brief and build a body of work for their portfolio. Masterclasses and workshops in specific skills and studio time with tutors and outreach ambassadors from undergraduate and foundation courses allows students to build up a set of new skills and techniques. At the end of the week, tutorials, critiques and exhibitions give students the opportunity to get feedback and celebrate the work they have created together. 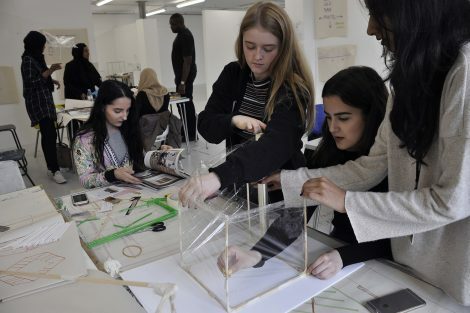 Last week, Chelsea College of Arts hosted the one week Interior & Spatial Design Summer School, here is a little insight into what the students got up to. The students were introduced to their theoretical project site and a range of challenges encountered in its current state. The site was the Chelsea College of Arts Parade Ground located in the centre of the college campus, a mediation space for the four blocks of the College that also forms a relationship with Tate Britain. The problems presented to the students were the variable environmental conditions that can be experienced when travelling across the Parade Ground between the different buildings. These conditions include wind, sun and rain. The different routes users may take also needed to be considered. The first task was to survey the site. Students were divided into small groups, each allocated a different climatic condition to develop solutions for. The groups surveyed the site through photography, drawing, taking measurements and annotating these accordingly. From these, they then created scale elevation drawings of the space. The second part of the project involved designing solutions. Groups discussed the ways in which the climatic conditions may affect the users’ experience of the site and considered five ideas for a Parade Ground Intervention. 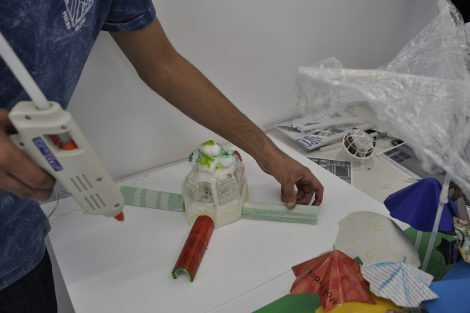 Students worked to produce sketches, collages, models and scale designs, to create an architectural or spatial solution to their assigned climatic condition. At the end of the week the students’ final solutions were presented to their tutors and peers in a feedback was session. The week provided students with a whole range of skill development, not only in practical creative skills but also communication and technical skills using computer aided design software. 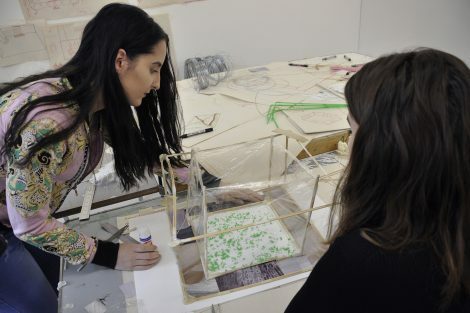 Find out more about BA Interior & Spatial Design at Chelsea.